The strength of Argentina's foreign insertion is proportionate to President Macri's weakness on the domestic front. President Mauricio Macri and Argentina are playing their own game at the G20 Leaders Summit in Buenos Aires this week. While the world’s focus will be on the bilateral meeting between Donald Trump and Xi Jinping and whether nationalism and protectionism will overtake globalisation and liberal democracy, Macri will be fighting battles on multiple fronts as he struggles to present Argentina as worthy of being a respected member of the international community. Not only is he looking to attract much needed investments that will help modernise the country’s crippling infrastructure and expand on natural resource treasures such as the Vaca Muerta shale gas formation, Macri is also betting on a cultural shift toward the centre-right, leaving behind Kirchnerite populism that was more aligned with Venezuela and Iran to fully embrace the US, along with the open and financialised market. At its most basic, this requires fixing a broken economy and securing an electoral victory in 2019, neither of which he can achieve through a flawless summit. 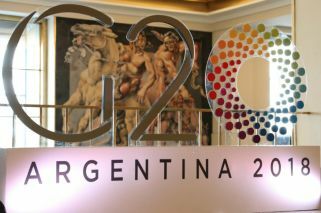 And while the risks of uncontainable violence in the streets and a breakdown of negotiations behind closed doors is high, if Macri can come out the other side with a few bilateral agreements under his arm and maybe a positive first-step toward the resolution of certain global geopolitical issues to which Argentina is essentially foreign, the G20 summit could end up being the beginning of a political turnaround that marks his legacy. It’s important to understand that from a global geopolitical point of view, Argentina is effectively irrelevant. Over the past several decades, the international community has only really paid attention to Argentina’s general policy stance, which has fluctuated between pro and anti-US, culminating in Néstor and Cristina Fernández de Kirchner’s intense anti-Americanism and absolute aligning with Hugo Chávez. Macri’s surprise 2015 electoral victory had a lot to do with an exhaustion among several sectors of society with Fernández de Kirchner’s aggressive and isolationist tone, particularly as the end of the commodity super-cycle was pushing the Argentine economy toward hyper-inflation, slowing output and currency controls. Macri’s electoral team, led by star Ecuadorean advisor Jaime Durán Barba and now Cabinet Chief Marcos Peña, built their winning strategy on being the mirror image of CFK, as Fernández de Kirchner is known domestically. Forget modernist ideology and eternal televised speeches, Macri’s PRO party focused on post-modern levity, touching on emotion and hope, reaching their audience through social media. After winning the election with a political coalition named Cambiemos (Let’s Change), they proposed an ambitious reforma agenda that sought to re-integrate Argentina into the global community while cutting the massive deficit and reducing inflation by shrinking the state and implementing pro-market economic policies. The former was a pre-requisite of the latter, as the Argentine state went on a debt binge in order to finance a gradualist approach that would allow them to normalise the economy. At the same time, becoming a relevant player of the globalised world meant embracing laissez faire economics. Arguably the strongest feature of Macri’s presidency has been his international acceptance. From his early trip to Davos where he was received like a rockstar — “the slayer of populism” — to his close relationship with all three superpowers — Argentina has received preferential treatment from the US, Russia, and China — Macri succeeded in getting the global community’s support, as evidenced by a record US$57-billion emergency loan from the International Monetary Fund (IMF) that allowed the country to avoid default, and the G20 presidency. Yet, the strength of Argentina’s foreign insertion — led by Susana Malcorra first and Jorge Faurie currently from the Foreign Ministry — is proportionate to his weakness on the domestic front. Macri beat out CFK’s candidate, Daniel Scioli, in a highly contested run-off, which confirmed his would be a minority government. In response, Cambiemos — which groups the Pro party with the Radical Civic Union (UCR), the Civic Coalition, and a few Peronists — sought to guarantee social peace by continuing the Kirchnerite policy of government handouts, while trying to push reforms that would shrink the state and put it on a path towards sustainability. This was the so-called gradualist strategy that failed miserably at the time when Macri had amassed the greatest amount of political capital. By the end of 2017, Macri’s coalition had secured a powerful midterm electoral victory, with Fernández de Kirchner defeated in the Buenos Aires province, the country’s most populous and a bastion of Peronism. The government teared down currency controls, lowered export taxes, and paid holdout creditors to lift a default that allowed access to international debt markets. Inflation was put on a sharp downward trajectory and reelection in 2019 was all but guaranteed. Yet little was done to tackle the major structural problems: a massive fiscal deficit that continued to grow and an unproductive economy that can’t generate enough dollars through exports to finance its demand for greenbacks. Come late 2018 and the G20 summit, Argentina has suffered runaway inflation, the economy has ground to a halt, and Macri’s political capital has been reduced to the point where several polls suggest Fernández de Kirchner could win back the presidency. The government needs to be fully alert. Just a week before the summit, and after Security Minister Patricia Bullrich said guaranteeing the security of a football match was a joke next to a G20 summit, the final of the continental football championship (the Copa Libertadores) between Argentina’s most popular teams — River Plate and Boca Juniors — was cancelled due to hooligan violence. A week before, amateur anarchists blew themselves up, sowing terror as multiple suspicious packages were found around Buenos Aires. The controversial Bullrich had better be up to the task if the government is to give a good image, particularly in the context of escalated violence around G20 meetings, not to mention rising social tension given the current economic situation. At the actual meetings, Macri’s high-level bilaterals with the likes of Trump, Xi, Putin, Theresa May, and Angela Merkel, to name a few, could result in increased trade opportunities and even direct investment, which would be a plus. Additionally, a positive resolution of the US-China trade war, the signing of so-called NAFTA2, and/or progress with Russia in relation to Ukraine and Syria could help Macri put this one in the history books. It’s not much, but he has room to hope.